Dr. G. Stevenson Smith spent time in Croatia as a Fulbright Scholar. Dr. G. Stevenson Smith recently completed a historic “first” for Southeastern Oklahoma State University. The John Massey endowed chair professor of accounting in the John Massey School of Business just returned from five months in Croatia where he fulfilled the role of a prestigious Fulbright Scholar. Smith is believed to be the first Fulbright Scholar from Southeastern since the program was established in 1946 under legislation introduced by Sen. J. William Fulbright. “I’ve always found it interesting to see other countries and meet other people and see how they do things,” said Smith, who as a professor at West Virginia University had taken sabbaticals to New Zealand and Australia. He’s also traveled to Italy to teach for a consortium of universities. Croatia, with a population of 4 million people, is located between central and eastern Europe, near the Adriatic Sea. 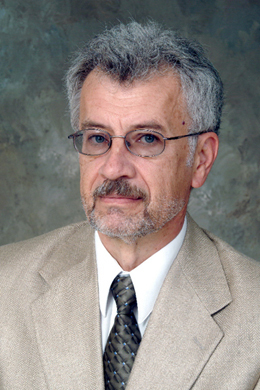 During his time at the University of Pula, Smith presented a series of lectures and seminars on forensic (fraud) accounting for a variety of groups, including accounting practitioners, judges, faculty, and attorneys. In addition, he assisted the university in developing a forensic accounting curriculum for its graduate students. “Croatia is soliciting membership in the European Union and one hurdle for membership is to ensure that measures are in place to help reduce the opportunities for fraudulent activities in government programs,” Smith said. As part of the Fulbright grant, Smith received living expenses from the U.S. and Croatian governments. From February to July, he and wife, Carol, lived in an old two-bedroom apartment Communist-bloc (provided by the University of Pula) near downtown Pula. “I think it was built in 1962,” Smith said. “It was a six-story building and we lived on the ground floor. The electrical wiring is different there, so one of the first things I did was buy an extension cord so I could plug in the toaster and coffee-maker at the same time,” he laughed. Smith said he had letters of invitation from three universities, but decided on the University of Pula because of its similar size (4,000 enrollment) to Southeastern.“The university is fairly new (founded in 2006), and the buildings are scattered about – it’s not a true campus,” Smith said. The university is led by a rector instead of a president, and is divided into five academic departments: economics and tourism; humanities; music; studies in Italian; and educational sciences and education. Smith’s typical day included extensive preparation for his customized Powerpoint lectures, the actual lectures themselves, continued research on numerous publications that he is working on, and when possible, some sightseeing. “The people speak English in Croatia, but it’s what I call ‘shopkeeper English,’ so the language barrier was an issue.” Among the sightseeing stops in Croatia were the remnants of various wars. And while the British may enjoy their afternoon tea, it’s a different beverage of choice for the Croats. Smith noted that the area offered some tasty fresh fish from the nearby sea, with the only hint of Americana being one McDonald’s restaurant. Smith holds a Ph.D. from the University of Arkansas, Master of Business Administration from Michigan State University, and a Bachelor of Science from Ball State University. In addition to Southeastern and West Virginia, he has been a faculty member at Western Kentucky University. Smith was one of only 13 Fulbright Scholars selected from Oklahoma this year, and one of only two business professors. Other faculty members who received a Fulbright in Croatia were from California State University, Michigan State University, University of Denver, Montana State University, and the University of Texas. Forensic accounting, fraud examination and curriculum development are Smith’s areas of research expertise. He is a co-author of the widely used textbook Forensic and Investigative Accounting (CCH 2009, 4th ed.). In addition, Smith has published articles on forensic accounting in the Journal of Forensic Accounting, Information Systems Security, and the Journal of Digital Asset Management, as well as writing a column on high tech financial fraud methods for the Journal of Forensic Accounting for six years. Smith noted the publisher of his forensic book, Commerce Clearing House, sent 22 copies of the textbook to Croatia so that he could give them to students. Recipients of the Fulbright Program are chosen not only for their academic achievements in their field but also for their potential contribution to the sharing of international ideas and solutions to mutual concerns. An extensive online application process is involved. His extensive list of publications and area of interest (fraud accounting) probably aided his selection, he noted. Those accepted into the program attend an in-depth orientation session in Washington, D.C. The Fulbright Program is sponsored by the U.S. Department of State’s Bureau of Education and Cultural Affairs. Also, for more than 60 years, the Council for International Exchange of Scholars has helped administer the program.